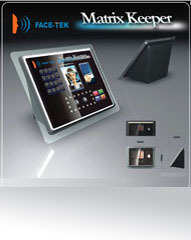 Face-Tek Matrix Keeper Entrance Controller System (FTMK) is the next generation of face recognition and access control system. This revolutionary device combines the infra-red illuminated cameras and DSP system. The proprietary IR LED matrix provides stable and gentle lighting that solves environmental lighting issues commonly associated with face recognition system. 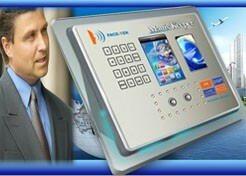 FTMK enables you to have 24/7 operation security and ease of use, day or night. The IR cameras take the live video from the scene and use the high speed DSP processor to execute the real time image process. Those processes include detecting the human face in the given video frame, extracting the facial image, getting through pre-processing and search the database for the closest matched result. Those complicated procedures have been successfully bundled seamlessly to a portable DSP platform, the Face-Tek Matrix Keeper.